The brand new Maxi Dolphin MD75 by Mills ha left the yard in Erbusco on Friday, 8th February destination Varazze on western Ligurian coast, where she will be launched for the first time. 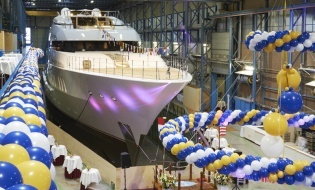 On February 5th, the eyes of the world turned once again to Livorno, where Italian shipyard Benetti successfully launched FB272, the second vessel to demonstrate its jaw-dropping new giga yacht building capabilities. In 2016, X-Yachts launched the new pure ‘X’ range which included the X43 and the X65. In 2018, X- Yachts launched two additional models, the X49 and the X46. The T11 is Nimbus’ vision of the perfect day boat with the ambition of perfecting easy living at sea while providing a social playground for friends and families. Championing ever more innovative boats for everyone is definitely BENETEAU’s hallmark, and in this respect the new Oceanis 30.1 holds its promises across the board.